Hey, Lolo. I know, last night might have been unfair. It was what it was, though, and I hope we can work through it. We realize that three weeks ago we were in Madrid, devouring delicious tapas and raciones, putting you at a disadvantage. Despite J’s craving for a burger last night, I felt like putting on heels and going somewhere lovely. And the last time we shared a meal together, you didn’t disappoint. But as when former classmates gather for a reunion, there’s bound to be some surprises, good and bad. And the distance between us has not been kind to you. Not to be shallow, but let’s start with appearances. The good: Your nicely spaced dining room with heavy, white chairs, warmly patterned banquettes and gigantic chalkboards announcing wine and food specials are welcoming. We can’t figure out why you’re rarely more than half full. And, the not so good: Why did you make us stand at the doorway for what seemed like a long time before anyone greeted us? That and the lull between courses made us think you didn’t care. The ugly: Did you know your tabletops are sort of sticky? They look clean, but there’s some kind of residue that is, well, unappetizing. Now, on to food. Not having had our Madrid-traditional large lunch, we were pretty hungry. I felt like a combo of small plates, and J spotted the burger, so that’s what we did. By far the winners of the whole evening were the two salads. The baby beet salad with gorgonzola and candied almonds, hazelnuts and walnuts was a divine crunchfest, and that shredded romaine salad with manchego cheese and a creamy, garlicky dressing was one I’d order again. Next up was the calamari, which was quite tasty with good texture. Nice. And the smoked paprika aioli was a nice touch, though the whole thing could have used a little acid. Lemon wedge, maybe. Then came the much-anticipated ham and cheese croquettes. Yours were golf-ball sized, a little large for my taste, and I’ll be honest: I’m not a fan of the potato-y texture in the center. Did you put potato in your bechamel? Tell the truth. And finally, the burger. I hate to be negative, but we were disappointed. Even the topping of blue cheese and romesco couldn’t pep up that underseasoned meat. It’s only saving grace were the gorgeous, crisp, thick, nicely seasoned homemade chips. Oh, Lolo. Maybe our expectations were too high, and perhaps we had unfair comparisons lurking in the back of our minds. With such a great location and space, though, we want to work it out. You’ll need to work a little harder if you want to win us back. Poor Lolo. I really do love the place. There’s such great potential, and I don’t want it to go away! 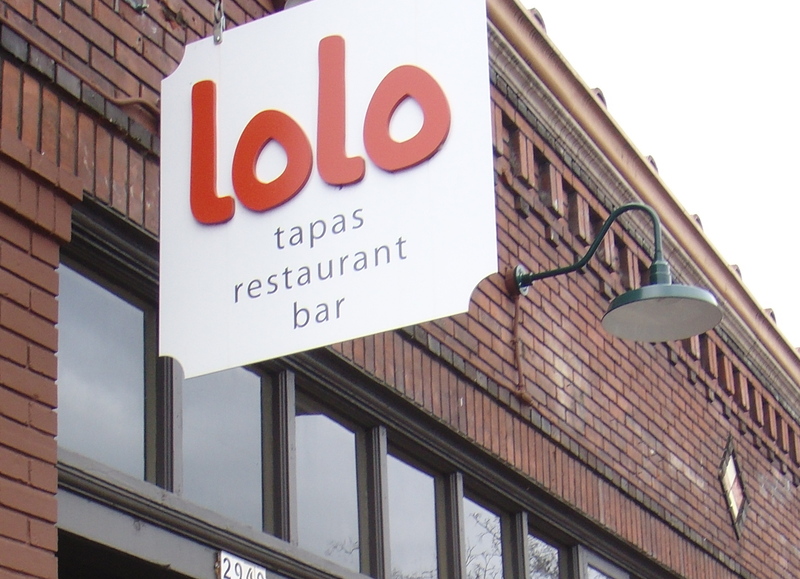 The baby beet salad DID sound good, don’t give up on Lolo just yet…. That shredded salad was awesome, really. I’d order a couple of those next time. I want it to succeed! We’ll try again later.